Rewind 75 years and East Anglia was dotted with airfields, with the RAF and the USAAF flying sorties over Nazi Germany and occupied Europe. Now mostly farmland, many are still marked with buildings that have stood the test of time, or memorials to the men and women that served on the bases. In need of a rideout, we plotted a route that took in 10 bases of the USAAF 8th Air Force located in Northamptonshire and Bedfordshire one sunny Sunday morning. Luckily the route’s a loop, so there’s no need to start at the same place we did; if you want to complete the same tour you can find the nearest airfield and memorial to you and pick the route up from there. We visited the memorials of the American air bases located in Kings Cliffe, Deenethorpe, Grafton Underwood, Chelveston, Poddington, Thurleigh, Kimbolton, Molesworth, Glatton, and Polebrook, starting with Kings Cliffe. Of the 10 airfields plotted on our route, RAF Kings Cliffe is the only that served as a fighter base. 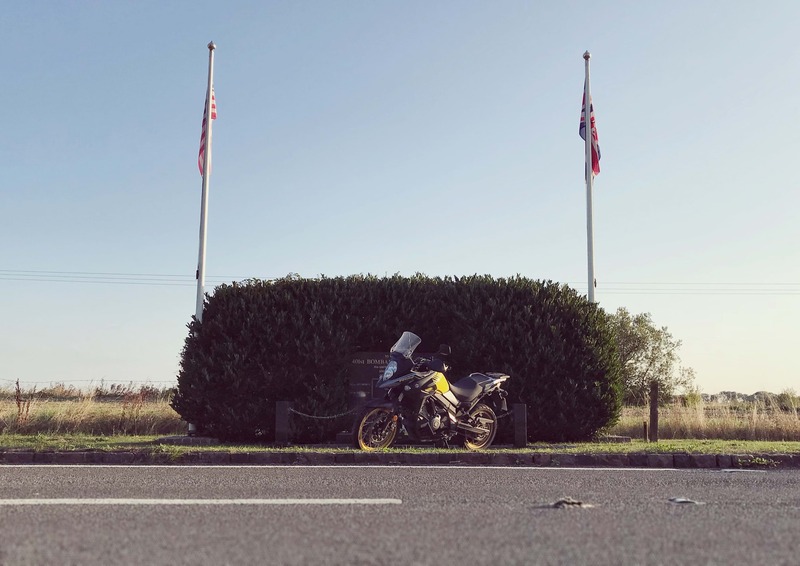 The memorial sits in a layby on an unnamed road that runs from the village of Wansford, off the A1, to the village of Kings Cliffe. It’s also the site of Glenn Miller’s last airfield concert. From RAF Kings Cliffe head down the hill towards the village, turning left at the t-junction and picking up signs for Blatherwycke. This section of our route is narrow country lanes lined with stonewalls, and devoid of white lines. With the morning light dappling through the trees, the road passes through two picturesque hamlets before joining the A43. We’re not on the main road for long, however. Just one junction later we dive off down an even narrower road that takes us into Deenethorpe, the village with which our next airbase shares its name. However, the memorial to 401st bombardment group sits on the A427, so after negotiating the village we pick up the road to Upper Benefield, passing through on the road towards Corby a short distance before it appears on our right, the stars and stripes flying high alongside the RAF’s roundel. After a moment to read the inscriptions, it’s an about-turn and we head back towards Upper Benefield, passing through again towards Lower Benefield, enjoying a sequence of left and right, 90° bends along the way as the morning sun starts to warm the asphalt more. Dropping down the hill and into the 30mph zone, it’s hard on the anchors for a right hand turn onto Causin Way, signposted Brigstock. It’s also back onto the narrow lanes for the next leg of the journey. Passing under the A6116 we drop down into the chocolate-box village of Brigstock, turning left for Grafton Underwood. 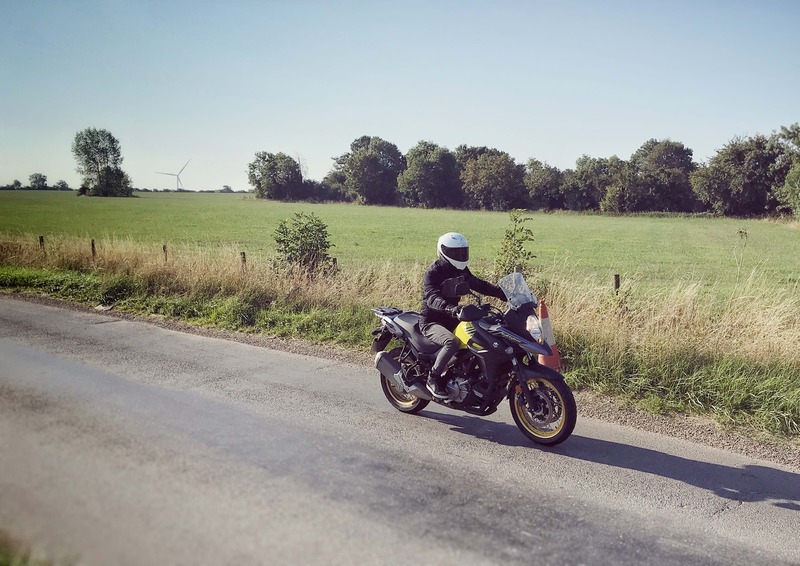 Continuing out the other side of the village we pass Brake Hill motocross track on our left and carry on to the village, and as we arrive it’s a sharp right turn that takes us to the airfield and the next memorial. Surrounded by poppy wreaths, the memorial is dedicated to the men and women of the 384th heavy bomber group. Leaving, we head back the way we came and turned right again to head through the village. The roads change from here though, with narrow back lanes making way for the A14. Heading east we come off to pick up the A45 south towards Raunds, before turning left at the next roundabout to head through on Chelveston road towards the village of Chelveston. It’s a short but sweet ride on a lovely section of flowing road to the next stop on the route, with the memorial to the 365th bombardment group in the middle of the village itself, next to the Star and Garter pub. It’s more A-roads after Chelveston, heading out the village to pick up the A6 past Rushden. Sunday traffic has started to pick up now, but cogging down a few gears allows for swift overtakes where required, before turning right towards Wymington and onto Poddington. Best known these days for the Santa Pod raceway, which is resides on the old airfield and runs its dragstrip up the runways, Poddington was also home to the 92nd bombardment group of the 8th Air Force from 1943-1945. Heading through another picturesque English village, the memorial stands on your right, almost immediately after turning left onto the aptly named Airfield Road. Another about-turn takes us on a return run through the village, back to Wymington, and back to the A6, before turning right and heading towards Bedford, but we soon pick up signs for Thurleigh business park, which now sits where Thurleigh airfield once stood, and the memorial for which resides inside the gates. Luckily, we can ride in, and follow the access roads around to Bedford Autodrome, passing the museum to the 306th bombardment group, with the memorial positioned in the corner of the lawn out the front, glinting in the summer sunshine. The 306th was the first operational bombardment group in the VIII Bomber Command. 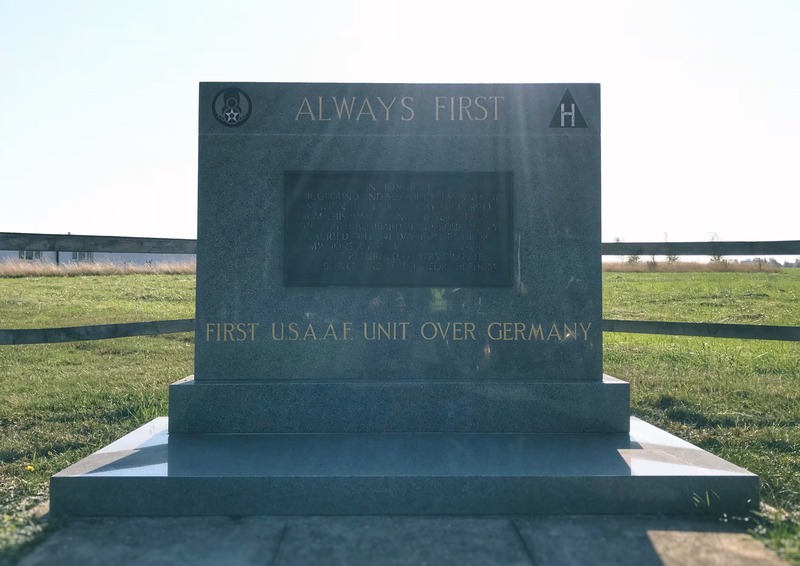 On the memorial is the message ‘Always first. First USAAF unit over Germany’. A quick check of the list shows us Kimbolton is next, so we leave Thurleigh and set off for another picturesque, English setting. The route takes us back onto some enjoyable B-roads, heading towards Riseley and Pertenhall, before entering Kimbolton. It’s a good run, with roads tight enough to offer a challenge including a series of 90° right and left-handers, but open enough to work the gearbox, too, culminating in a downhill straight towards the village. Dropping into the 30mph zone, we turn left at the t-junction towards the high street, passing old buildings and the church, before exiting the village and turning right towards the A14. The memorial sits outside a now industrial estate, where the airfield would have sat, elevated above the village. From there, 330 combat missions were flown by the 379th bombardment group over Germany and occupied Europe. Three to go, and it’s to the A14 towards Kettering, but only one junction before turning off for RAF Molesworth, which is still an active US base and easily found thanks to the signposts. Turn in through the main gate at the top of the hill and you can’t miss the memorial to the 303rd bombardment group. Back out the gate and it’s another cracking route to the penultimate stop, Glatton Airfield. The B660 is a tremendous bit of road, and you’re rarely upright, swinging from left to right through tighter turns, chicanes, and sweepers, on the way to Glatton and the A1M. Unlike many of the others, Glatton airfield is a little way outside the village, and often referred to as Conington airfield. Heading down the hill into the village we carry on out the otherside, crossing over the A1M, turning right to pick up the old road and head south to the memorial, located on the side of the road. It’s a fairly significant memorial to the 457th bombardment group, with flags flying and benches dedicated to memories of veterans, too. There’s also a water tower that stands tall behind the trees, clearly visible from the main road and, memorial aside, the only giveaway of what used to exist behind. The final stop is Polebrook, and arguably the most sereen. While other memorials sit on industrial estates or main roads, this one is tucked away, and sits on an area of concrete at the head of the old main runway. From Glatton, the old A1 towards Peterborough joins a roundabout at Norman Cross, but the route takes us through Folkesworth, before following signs for Polebrook and Lutton. It’s narrower back lanes again, with white lines splitting lanes disappearing as we head towards the farm the memorial now lives on. Nipping through the gate the memorial sits between a tree-lined concrete patch, and the wind rustles through. It’s nearer midday and a lot warmer. After one last picture and reflection, it’s back on the road, making one last run for home. Somewhere many to which the memorials are dedicated never made it back to.